1514 by Michael Allgoewer is now on view at the McMaster Museum of Art. A single 500-year-old engraving by German artist Albrecht Dürer has inspired an ambitious body of sculptural work by Hamilton artist Michael Allgoewer. The result is an exhibition titled 1514, which is now on view at the McMaster Museum of Art. 1514 is the year that Dürer engraved “Melencolia I,” an enigmatic image that has been a source of fascination for artists, scientists and occultists ever since. It depicts a female figure seated amidst various objects that seem to relate to geometry, alchemy, mathematics and the nature of beauty, but defy specific interpretation. Allgoewer’s work echoes Dürer’s. The ladder, meteor, magic square, wings, trisquare, polyhedron, sphere and moonbow are represented, but now in three dimensions. Allgoewer has shown extensively in solo and group exhibitions, in both public and private galleries for more than 30 years. 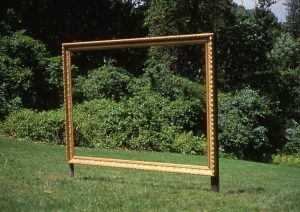 This is his first solo exhibition at McMaster, although his work has been included in three previous exhibitions on campus, including a 2006 exhibition Zone 6B: Art in the Environment when his gilt frame work Islands #1 was installed in the Faculty Hollow. He is represented by b contemporary gallery in Hamilton. Michael Allgoewer: 1514 exhibition is on view until March 16, 2019. The artist will be presenting a free public lunchtime talk at the Museum of Art on Thursday, February 7, 12:30-1:20 pm. A single 500-year-old engraving by German artist Albrecht Dürer has inspired an ambitious body of sculptural work by Hamilton artist Michael Allgoewer. The result is an exhibition titled <em>1514</em>, which is now on view at the <a href="https://museum.mcmaster.ca/">McMaster Museum of Art</a>. 1514 is the year that Dürer engraved “<em>Melencolia I,” </em>an enigmatic image that has been a source of fascination for artists, scientists and occultists ever since. It depicts a female figure seated amidst various objects that seem to relate to geometry, alchemy, mathematics and the nature of beauty, but defy specific interpretation. Allgoewer’s work echoes Dürer’s. The ladder, meteor, magic square, wings, trisquare, polyhedron, sphere and moonbow are represented, but now in three dimensions. “I’m taking Dürer as a starting point,” says Allgoewer, “but I’m also referencing work by contemporary artists...Anselm Kiefer, Joseph Beuys, Donald Judd and others, many of whom have also done work directly based on <em>Melencolia </em><em>I</em>.” [caption id="attachment_86046" align="alignnone" width="490"]<img class="wp-image-86046" src="http://dailynews.mcmaster.ca/wp-content/uploads/sites/3/2019/02/Michael_Allgoewer_photo_by_Jeff-Tessier-300x201.jpg" alt="" width="490" height="328" /> Michael Allgoewer. 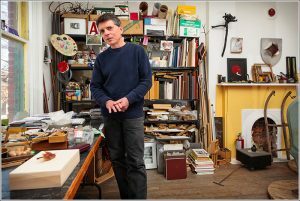 (Photo by Jeff Tessier)[/caption] Allgoewer has shown extensively in solo and group exhibitions, in both public and private galleries for more than 30 years. This is his first solo exhibition at McMaster, although his work has been included in three previous exhibitions on campus, including a 2006 exhibition <em>Zone 6B: Art in the Environment</em> when his gilt frame work <em>Islands #1</em> was installed in the Faculty Hollow. [caption id="attachment_86047" align="alignnone" width="560"]<img class="wp-image-86047" src="http://dailynews.mcmaster.ca/wp-content/uploads/sites/3/2019/02/2000_Faculty_Hollow_allgoewer-300x212.jpg" alt="" width="560" height="396" /> Islands 1 by Michael Allgoewer[/caption] He is represented by <a href="https://bcontemporary.wordpress.com/">b contemporary gallery in Hamilton</a>. 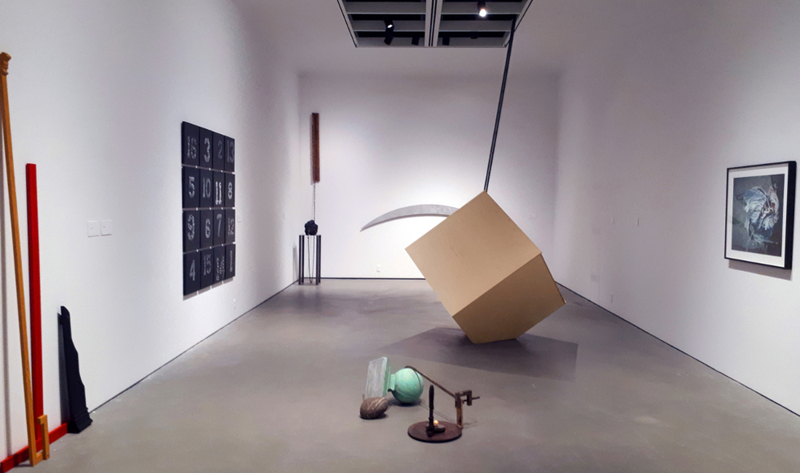 <em>Michael Allgoewer: 1514</em> exhibition is on view until March 16, 2019. The artist will be presenting a free public lunchtime talk at the Museum of Art on Thursday, February 7, 12:30-1:20 pm.